L’Etrier, open for dinner, offers some of the finest French cuisine and wines. The elegant Côte Royal serves breakfast and sumptuous seafood evening buffets. 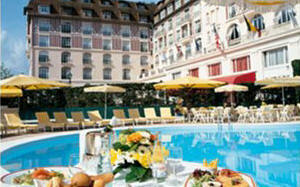 La Piscine, a relaxing poolside setting for barbecue and buffet lunch. Bar de l’Etrier, a perfect rendezvous for champagne and light meals. 24-hour room service.